Mere moments away from the very centre of London there lies a quiet, almost secret little road called Lower Robert Street. 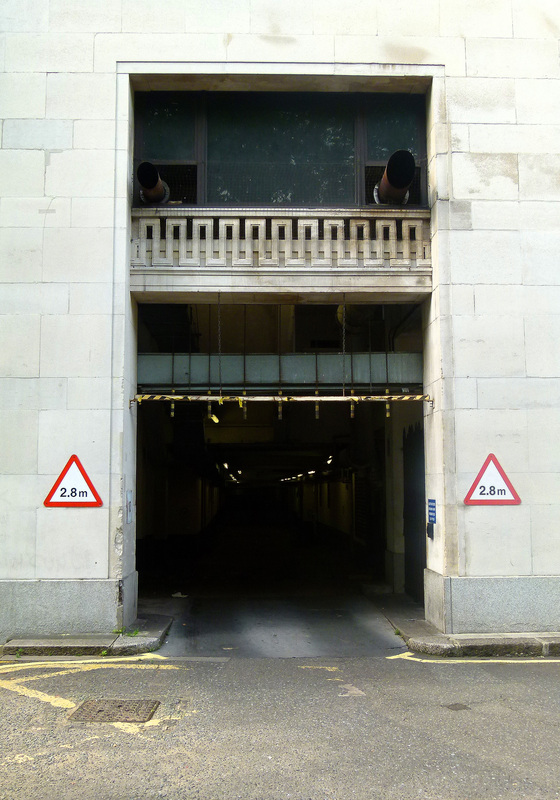 Sandwiched between the Strand and Victoria Embankment and running through a twisting tunnel, Lower Robert Street is a covert cut-through we cabbies sometimes like to use if in the area and wishing to make a quick exit down to Victoria Embankment. In recent years, Lower Robert Street’s grotto like appearance has gained it a nickname: the ‘Bat Cave‘! Lower Robert Street dates back to the late 18th century, created as a by-product of ‘The Adelphi’; a large housing development consisting of 24 grand, terraced houses. The project was developed by four Scottish brothers; John, Robert, James and William Adam, whose fraternal bond blessed the scheme with its name- ‘Adelphi’ being the Greek word for brothers. Construction began in 1772, with many of the labourers who worked on the project also being Scottish. Nowadays of course you’ll often hear battered radios crackling away on building sites, but when the Adelphi was being built, music for the toiling workers was provided by a group of specially employed bagpipers! Because it was so close to the river Thames, the Adelphi was located on a slope. The main building – the row of ornate houses- remained level with the Strand, jutting out over the incline. To fill in the large void below, a complex of vaulted arches and subterranean streets were created- of which Lower Robert Street is now the only remaining example in practical, public use. Many famous people lived in the grand apartments above including the actor David Garrick, Richard D’Oyly Carte (founder of the nearby Savoy hotel), Charles Booth (the great, Victorian social reformer) and a number of notable literary figures including George Bernard Shaw, Sir J.M Barrie and Thomas Hardy. In the late 1860s much of the Thames in central London was reclaimed as part of a vast engineering program to improve the city’s sanitation, the waters pushed back as the wide Victoria Embankment was built. This major road (which to do this day still conceals a vital sewer) was built right in front of the Adelphi’s lower vaults and roads, robbing them of their tranquil riverside location. Once cut off from the Thames, the area beneath the Adelphi sank into decline, rapidly becoming a gloomy, foreboding place. A famous image depicting the appalling conditions in which London’s Victorian poor existed. Such a sad sight would have been common place beneath the Adelphi. Unsettlingly (and, perhaps unsurprisingly), Lower Robert Street, which was once an ingrained part of this depressing area, has its own resident ghost…. The phantom is known as ‘Poor Jenny’; a prostitute who lived and worked in the depths of Lower Robert Street, the bed upon which she languished being no more than a grotty pile of rags. Great post – and great blog. I am going to check out Lower Robert St this lunch time! Thanks, Rob… hope it doesn’t creep you out too much! Robert Elms invited people to call in to his Notes & Queries phone-in last week. He joked that cabbies used it to show-off, but it’s actually a useful cut through. Great piece of research, Mr Lordan. I’m going to mention it when I prepare my next Taxi article mentioning The Batcave. Really interesting. Walked past here a thousand time and assumed it lead to a car park! I read elsewhere that this is one of two underground streets left in London. Any idea what the other one is? Thanks, Simon. I have no idea where the other street could be though… I’ll keep an eye out for it! Great post, I never knew this existed. I remember being amazed when visited the RSA at Open House Weekend and saw the underground street, so will can’t wait to see this. Open House w/e coming up in couple of weeks btw so I should imagine their will be chance to see it then. Thanks, Kitty. Looking forward to Open House too, one of the best events in London’s calender! Great blog, will have to try to get this into one of my runs. Thanks, Richard. Have fun exploring! Could the other underground street be Corner House Street? 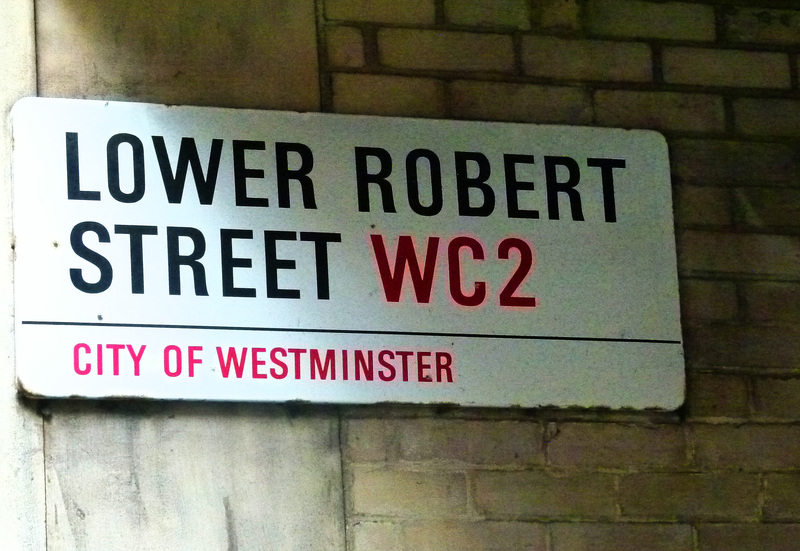 Incidentally is Lower Robert Street one way? I see what you mean with Corner House Street. The building which bridges it is quite modern though, not sure what it looked like years before. Lower Robert Street is indeed one-way, you approach it via York Buildings. Yeah probably not Corner House street. Possibly Castle Banyard street though? From a knowledge boy 1 year in. Leake Street and Station Approach Road at Waterloo are possible contenders too… Hope the Knowledge is treating you well! Thanks for the back story. I used to enjoy using it as a cut through about 20 years ago. Even better, I really impressed my nephew when I used it in Grand Theft Auto! Just discovered your blog very entertaining. This passage used to be two way. Before the yellow lines were put down you were able to get from the Embankment up to the Strand. Much more useful than now. 24 hour access too. Thanks for the great info. I read about Lower Robert Street in London Under by Peter Ackroyd. Looking forward to visiting it on my next trip to London! Just read a reference to this street in Ackroyd’s book, googled it, found this blog. Wonderful! I’m bringing urban sociology students to London this summer from Texas – this goes on our list of cool underground stuff in London to explore. Hi Bob, many thanks for such kind words. If you need any more advice regarding your visit to London please let me know. Just discovered this site, also thanks to Mr. Ackroyd’s book London Under. Visited London a few years ago and was fascinated! I like your introduction regarding the London cab you drive – I will definitely use cabs as a resource when I return. Thanks, Dave appreciate your kind comments. Another Ackroyd fan here but I like the way you pull together lots of detail. Definitely on my list of things to do. Guiding a chauffeured tour tomorrow and the driver loves going through this tunnel, so needed a few well-chosen words on it. Job done, cheers Rob! Thanks, Mark! Try not to get too spooked out down there…. I only read this post yesterday, and found myself stuck on the Strand earlier this evening – Lower Robert Street worked a treat! I put my window down and listened out for Poor Jenny, but no luck! great article, I work almost next door and agree with the above in thinking it was a car park! I’ll have a walk down there at lunch, hopefully not seeing the ghost! I think the other below London street is Lower Compton Street, not that it can be walked though. That’s intriguing, Norman… can you remember whereabouts roughly? Yes Norman, I’m sure I remember this too, from working as a motorcycle courier in the mid 70’s. Am also convinced it ran through the Savoy basement over part of its route, and came out on or near the Embankment? Many years now since I was in London, so only going from (my possibly wanting) memory. I also remember another short cut like this from High Holborn (just past Drury Lane) to Endell street, I think you came out on Shorts Gardens, which was a life saver past the backed up traffic. Also looked like you were driving into a car park. Has it been blocked off? Walked through here last night in search of Poor Jenny, in the company of my tour guide, Flora. Thanks for a fantastic eye opening tour. We also met a ‘Canadian’ who sleeps rough and told us about waking up one night last week to find a fox curled up asleep on his feet! Say hi to him if you visit.